Inside: A simple healthy chocolate fudge recipe. Despite being healthy, it’s rich and decadent. It’s easy to make, and tastes amazing. This is the best ever chocolate fudge that you can eat guilt free. The whole family will love it, that’s if you want to share with the kids! Grab this recipe now or regret it. Delicious healthy chocolate coconut balls. A fudge recipe is of course going to get me excited. A chocolate fudge recipe is going to get me bouncing off the walls, but then it all comes crashing down. That torture between what my head and stomach are saying to each other. You have seen those adverts…”my stomach want’s chocolate but my jeans want a salad!” They might make you laugh, but they are totally me right now. As I am desperately struggling to get back into my pre-pregnancy jeans, my clothing is literally SCREAMING eat salad….for heaven’s sake girl, eat salad! BUT, and this is a big but! At the end of the day, when I am tired, and weary from looking after a 4 year old and a 4 month old, I don’t want salad. I’ve spent the day exhausted looking after the kids, and this is now my time to sit back, relax and enjoy. And so begins my new love relationship with this awesome chocolate fudge slice recipe. But, it’s not just any chocolate fudge, it is a totally healthy one. It may sound like a fantasy, the ability to eat something as sticky and chocolaty as this without feeling an ounce of guilt, but that fantasy is about to become a reality for you. This is one of those must have healthy chocolate fudge recipes that is going to make you the hero not only in your own family, but in your group of girlfriends too. Heading to your mum’s group soon? If you want to take something different to the normal (but delicious) easy moist banana bread recipe, this chocolate fudge recipe is the perfect thing. Of course those are pretty darn tasty too, but why not indulge and forgot about those guilt feelings too. It’s a much better way to go in my opinion. We first started eating this fudge when my daughter was a toddler. I had lost all my initial baby weight, but then it slowly started to creep back on, little bit by little bit. Body fat seriously has a way of creeping up on you without noticing and then suddenly you go to your wardrobe and nothing fits. Desperate times called for desperate measures, but I was determined not to give up my chocolate. I am far too stubborn for that, and there had to be another option. So after much searching, we came across a recipe by I Food Real and decided to give it a try. My husband is the baker in my house, so he decided to give it a bit of tweaking to come up with this version. From the first mouthful it was totally delicious. I know what your thinking though…I can almost hear it through the computer. An indulgent chocolate fudge such as this can no way be healthy. Well, do you want to know what the secret is? Believe it or not, protein powder and avocado make up the bulk of this fudge. It’s hard to believe, but totally true. 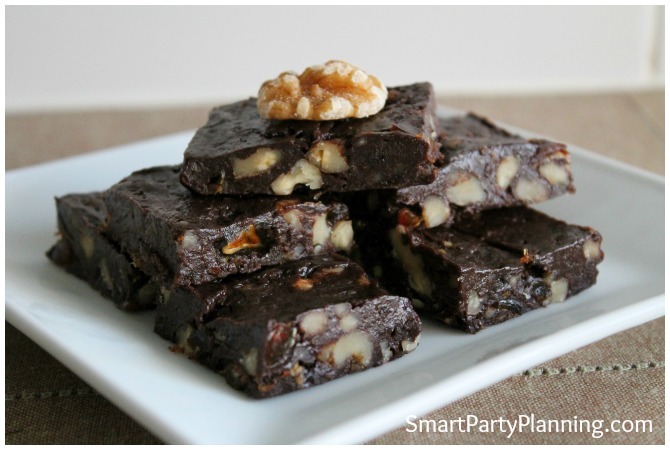 You can use any protein powder for this fudge recipe, but the one we use is from Isagenix. This is purely because their protein powder also contains the full compliment of trace minerals that your body needs. The great thing about this fudge recipe is that all the ingredients are raw, and with the addition of protein powder, you know that it is going to be kind to your body. It is not your normal sweet treat by any means. Ok so that is a bit of jargon I know. You can blame my hubby for that as he is obsessed with all those kind of details. But for those of you like me, all you need to know is that it is indulgent, sticky, and feels so so naughty! Obviously this fudge recipe does still include fat, so you can’t gorge on it, but the fats are healthy fats, and is much kinder to you than any other sweet treat that are loaded with artificial sugars. As I said, I first started eating this when my daughter was just a toddler, so she started eating it too. It was kinda cute as she would give me that grin of “I’m eating something soooo naughty! !” and she would call it her “special treat”. What she didn’t know and what she still doesn’t know is that this ‘special treat’ is full of goodness and no added sugar. I don’t know about you, but that is the kind of special treat I love to give my kids. What’s even better is that this fudge recipe is incredibly quick and easy to make, so you can always have a stock available in your freezer. Print off the recipe below and keep it somewhere safe so you can grab it when you need to satisfy those sweet teeth cravings. You will be so pleased that you did! 1. Add the avocados, cocoa powder, protein powder, honey and salt to a food processor. Process until it reaches a smooth consistency. 2. Add 1 cup of walnuts and 1 cup of dates. Process until smooth. 3. Add another 1 cup of walnuts and the remaining 1/2 cup of dates. Process again until smooth. 4. Add the remaining 1/2 cup of walnuts and pulse a couple times. 5. Prepare a 8x8 baking dish with baking paper and fill with the fudge mixture. Press firmly with the back of a spoon. 6. Freeze for at least 3 hours. Remove from the pan and slice into desired size pieces. (Note: If you don't have a food processor, simply chop the dates and crush the walnuts. Mix together using your hands. Whilst this wont be as 'smooth', but it will still provide a great texture). This fudge can be stored in the freezer and does not need to be defrosted before eating. So now there really is no need to continue with that struggle of your head wanting chocolate and your jeans wanting salad, because this healthy chocolate fudge recipe will meet all the criteria at once. It doesn’t get much more perfect than that does it! Do you normally bake with protein powder? If not, then this is a great recipe to start with. I promise you can not taste it at all!! Do you think your family would love this chocolate fudge recipe? Why not share it on Facebook so your friends can make it too! This recipe looks delicious and perfect for my health conscious family. I can’t wait to try it! I’m definitely letting my kids have that one. Can people contact you to get the Isagenix Protein shakes? Oh you should try them Cathy…the kids will love them!! Lol that is so funny Ashley!!!! I guess they would be ready for breakfast if you made them now….he he. When does the honey go in…..?? Thanks for sharing at Saturday Dishes. I’m so pinning this! Who knew fudge could be healthy! My husband loves to cook and try new things in the kitchen too. Love the recipe! Thanks for linking up to the Tips and Tricks link party. Oh, I love fudge! This looks great! can you use the chocolate instead of the vanilla as I don’t have any vanilla.